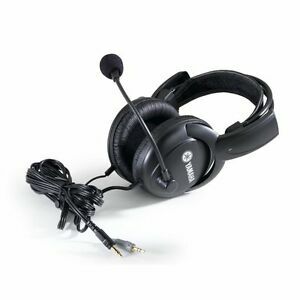 Equipped with a 9-foot cord to give you ample room for movement, the Yamaha CM500 headset works well for a broad variety of devices and accessories. These headphones come with 1/8-inch and 1/4-inch adapter jacks for wide compatibility. Plug them into your equipment, lower the built-in microphone to a comfortable position, and you are ready to enjoy clear audio quality. Having a flip-down mic makes them ideal for audience-interactive DJs to respond to the crowd. The padded, closed-ear construction protects you from outside noise so that you can focus on the music or conversation. A durable build from long-lasting materials ensures that they will be going strong even after many trips to the dance floor.Any device equipped with a standard headphone jack can be used with these Yamaha CM500 headphones. The microphone plug can be used with any device that supports it or you can connect it into the included battery module. This allows it to be used with audio equipment that ordinarily requires mics that use +48V phantom power sources. Some professional audio accessories use this standard, so you can combine this unit with high-end mixers and amps. Compatibility with a large number of ham radio models, including those with foot-switch mic operation, make them a great option for enthusiasts. The mic also makes it simple to communicate with your partners when playing a video game. The adjustable boom arm for the microphone allows you to conveniently move it up and out of the way or quickly flip it down to speak.Two AAA batteries can be placed in the headset battery box to power the microphones when connected to accessories that do not supply voltage to them. Use it in conjunction with many software apps and accessories, such as Skype, to make conversation easy. Pro audio quality and a sensitivity of 96dB/mW will allow it to be used in school music labs under high-stress conditions without fail. An impedance of 120 ohms protects them from being damaged by overloading, reducing the likelihood that the device will cause them to blow out. The microphone impedance of 600 ohms is fitting for most modern mixers and tape recorders.Frequency response on the Yamaha CM500 headset meets the industry standard of 20Hz - 20kHz. The microphone range is 100Hz-20kHz. This aids in producing mic quality clear enough for video voice-overs and podcasts. High-impact materials shield the padding from scratches or tears. The highly flexible headband keeps it comfortable as it fits snugly against your head. They are only 10.6 ounces, which keeps them comfortable during extended use. A soft cup design firmly covers your ears to cancel outside sound without excessive pressure.Stereo sound support is included for the best experience when listening to track recordings or watching videos. Use the volume control on the device they are plugged into for a sound level that is right for you. The Yamaha CM500 headphones provide uninterrupted sound reproduction. This makes them a suitable choice for listening to tracks in the studio while playing instruments. I absolutely love these headphones and what they do for the price point they are being sold at. I use these for podcast and general recording along with my other microphones and recording gear. Great product and quality makeup for a price that probably would be much more for other products. I've seen plenty of headsets that are selling in the 150 to 200 dollar range that I don't feel would be any better or much substantial difference in the quality of the product. These are well made communications headphones with the mic and everything sounds great from listening to audio via Sirius or Spotify or even my own music collection via the computer. Will be doing more recording using these for podcasting and general recording quality. Great little product at a fair price and sounds good listening. I could have spent 200 bucks on a Sennheiser or Audio Technica type of headset not to mention Heil gear which I already have but this is a nice little piece to the collection. I also own one of the Heil headsets and this one is just about the same quality and sound at much less. Works great for amateur radio use. Be sure to adjust the EQ on your voice to accomodate the mic as compared to a desk mic, as it is richer in the higher frequencies, understandably, but once that si done, it sounds great both on the air and in the headphones. The CM500 is light and easy to wear for contest sessions. Plugs straight into the back of a K3 with rear panel electret bias set. I have two pairs, one for backup - unneeded over six years so far.